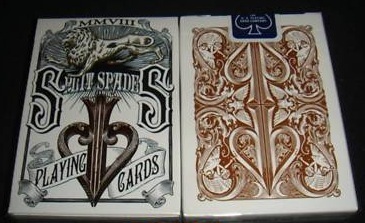 Released in April 2008, the Lions edition, David Blaine Split Spades displays subtle design changes from the Original Split Spades with a redesigned Ace of Spades, Joker and back design. 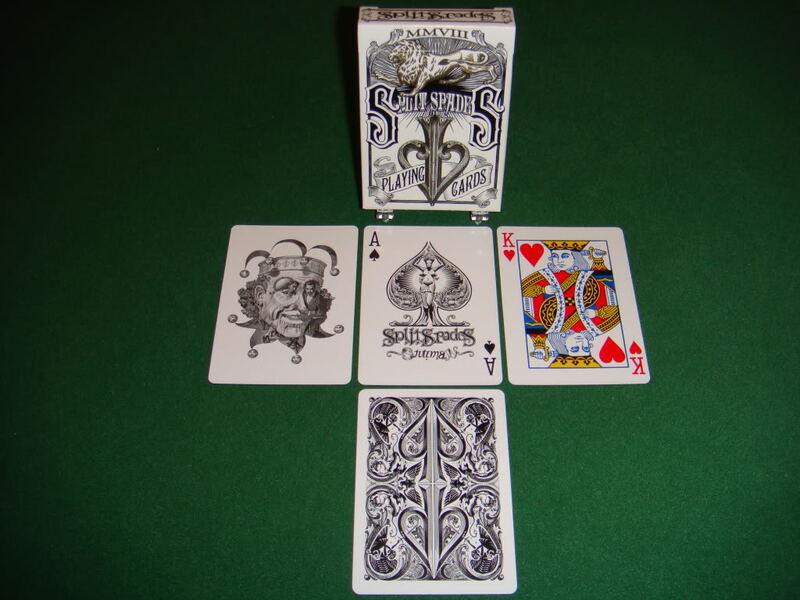 The playing cards were produced by David Blaine in association with Mark Stutzman and Dan White. The back design continues the theme of the Split Spades deck containing many subtle two way images. In comparison to the originals, the tiger gives way to a lion, and the talons which adorned the first back design, also by Stutzman, are now replaced by wings. It is said that David himself experimented with the feel and finish until he was completely satisfied. The Ace of Spades utilizes ambigrams (words written in a style where it spells a certain word, but when you look at that word up-side-down, it spells a different word). 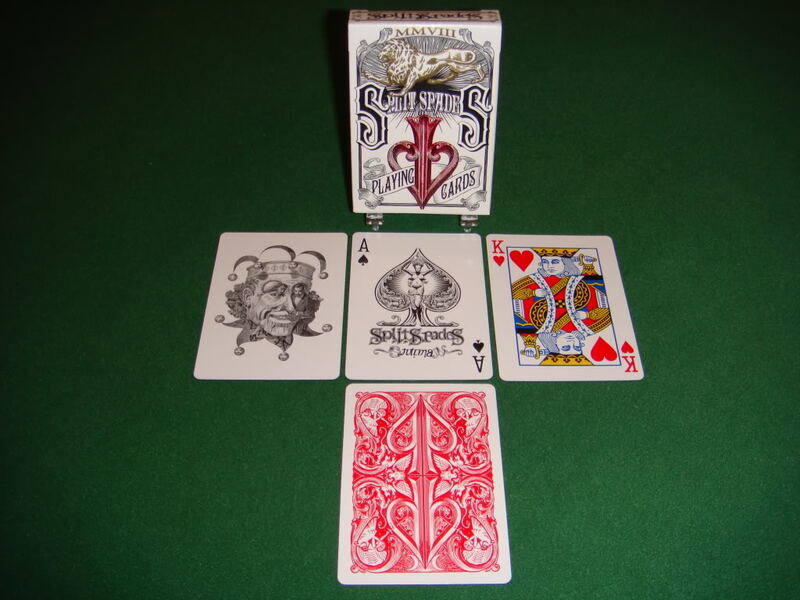 The words "Split Spades" spell the word "Superstitious" when read up-side-down, and the word "Stutzman" spells the word "Blaine" when read up-side-down. If you look carefully at the center pip, within the shape and form of a naked lady, you can see the gestalt of a Lion’s face. 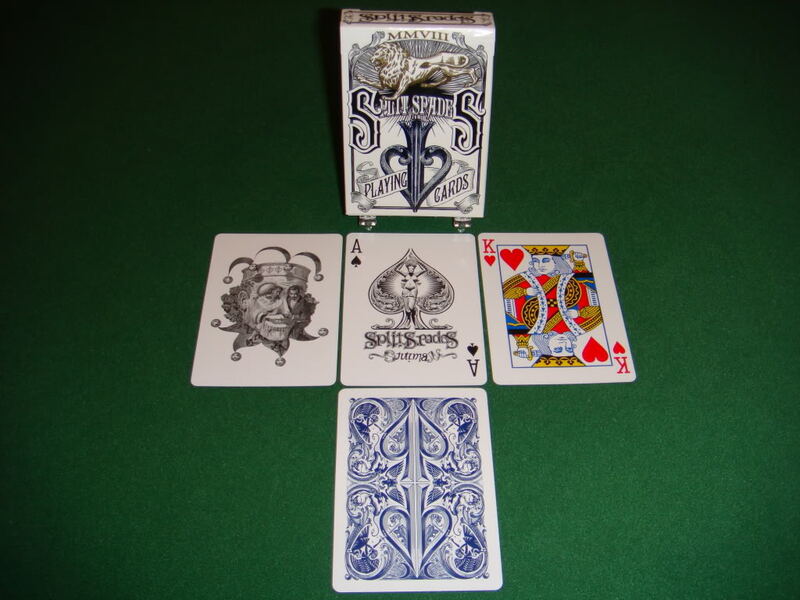 Some of the court cards feature special faces; The King of Spades is David Blaine, The Queen of Hearts is his mother, the Queen of Spades is Lonneke Engel (a close friend), the Queen of Clubs is Denise (one of the producers), the King of Hearts is Bill Kalush, the King of Clubs is his friend from HS named Lou, the Jack of Hearts is Mark Stutzman (who drew the deck), the Jack of Spades is his brother, the Jack of Diamonds is Dan White, and the Jack of Clubs is Doug McKenzie. The face of the Jokers is comprised of David Blaine and the devil playing cards on a table in a garden. The bells on the jokers contain faces of the custom Kings, Queens and Jacks. The Blue Split Spades Lions deck comes in what is known as the Mnemonica stack (made famous by Juan Tamariz). Some of these come in a sepia coloured box, whereas the cards inside are blue.